The V-7240 is the most efficient vertical baler for sale. The 72" x 28" x 40" feed opening means you can bale large volumes of cardboard easily and quickly. Total baling force is over 98,100 pounds and a regenerative hydraulic circuit cuts baling time in half. Bales of corrugated cardboard weigh 1,100 to 1,200 pounds. 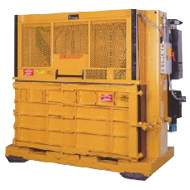 The V-7240 is an extremely safe baler that maximizes recycling revenues in supermarkets, warehouses, or manufacturing plants. Bale 2 to 4 times more cardboard per hour than with any other vertical downstroke baler on the market today! 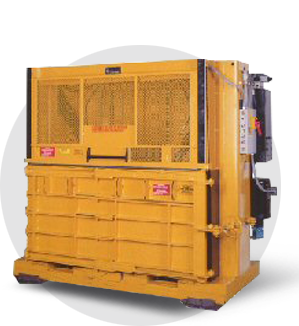 The low loading height (less than 4 feet) increases baling efficiency and also reduces the possibility of injuries caused by having to lift cardboard into the higher openings of standard balers. Mounted on heavy duty casters with a space saving design, the V-7240 can easily be located where scrap cardboard is produced to increase operating efficiency and cut labor costs. • Low loading height of only 47"